On Saturday, May 19, over 200 first responders, volunteers, and community leaders from across the North Bay and beyond came together to recognize Inspiring Achievements in Community Preparedness. The event venue was the Sonoma County Fairgrounds, site of the massive shelter, command center and camp during the October fires. Sonoma County Supervisor Susan Gorin began the award ceremony by presenting Challenge Coins, on behalf of District 1. Next, Congressman Mike Thompson took the stage to personally present Congressional Recognitions to every HALTER Award Recipient, as well as several others, including the HALTER Project, Supervisor Gorin, and radio host Pat Kerrigan, for their roles during and after the fires. Quite an impressive start to the evening! Earlier, guests mingled outside the Grandstand while singer-songwriter, Adam Traum, entertained as they enjoyed delicious and elegant farm-to-table hors d’oeuvres (and later, dinner) prepared by Park Avenue Catering. The HALTER Community Preparedness Award Ceremony was presided over by Emcee Pat Kerrigan of KSRO Radio, the voice of news and reassurance during the October Wildfires, and a resident of Kenwood. Many toasts were made, thanks to wine sponsors, Atwood Ranch, Beltane Ranch, Gloria Ferrer, and Kunde Estate Winery. All wines served were from properties inside the fire-ravaged evacuation areas of Sonoma Valley. Resilience and readiness were the hallmarks of the evening. The Showcase Cafe at the Sonoma County Fairgrounds, home of Wine County Racing, was the perfect setting. Guests had an opportunity to tour the Sonoma Animal Emergency Response Trailer during the reception and chat with Animal Technical Rescue Instructors, veterinarians and and equipment developers. This event marked the first time Preparedness efforts, rather than response, have been recognized in the North Bay. While acknowledging the selfless acts that characterized events last fall, the spotlight was on the work that goes into readying personnel, Volunteers, and residents for that response, safety, and faster recovery. Honorees were chosen for not only their work, but also the inspiring models they provide to communities across the country. Recipients range from esteemed veterinarians from UC Davis and Louisiana, a rescue equipment inventor from rural Mendocino County, the first retail business devoted entirely to safety & disaster supplies, and a diverse group of Animal Welfare Volunteers. Film clips, photos, and heartwarming and hilarious speeches brought their stories to life on big screens. 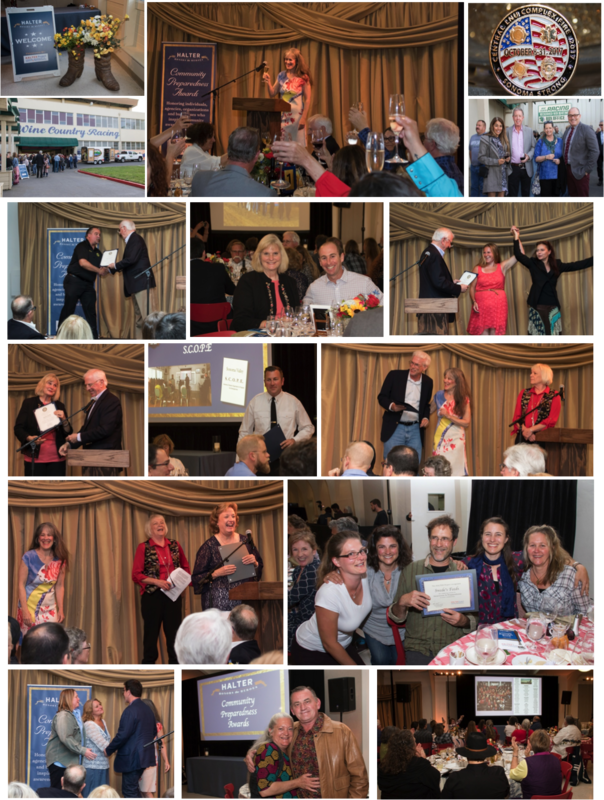 Here’s a list of all HALTER Community Preparedness Award Honorees, with photos from the evening. Hope you’ll enjoy them and applaud these wonderful and inspiring people.